Russell Westbrook with the one handed demolition on Gerald Green. Yao showing some toughness and slamming one on the King of Weak J's. Rodney Carney with the two handed smash on Anthony Parker. Dash Harris is now officially known as the Cookie Monster, since he apparently loves to devour his Cookie's dunked on style. This video has a couple of nice 'Nique dunks, but check out the one at the end where he dunks on Larry Legend. 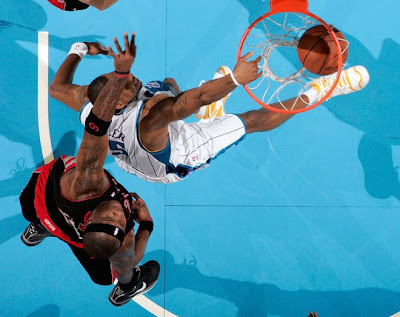 The pic above is a different dunk though before I start getting comments about it, haha. Check out a couple of sick high school poster dunks from USC's DeMar DeRozan. Patrick Patterson returned to action yesterday against Tennessee and promptly introduced himself to Wayne Chism. Props to ukcat8fan for the vid. Joakim Noah gives Nene the bizness. Nice dunk right here. Uhh yeah, like you didn't think I was gonna post this one? Pic please? The Hilton has officially filed for bankruptcy. Times are rough out there for an Armstrong. 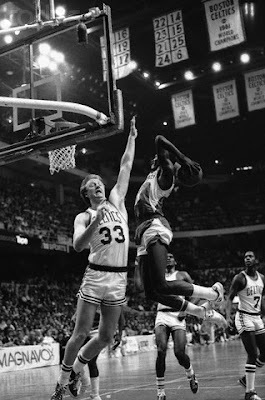 Dr. J gets the outlet pass from Larry Legend and proceeds to posterize Artis Gilmore. this Wednesday, February 18th at 9PM Eastern/6PM Western time. The winner is chosen by fan voting, so basically I need you guys to represent for me and sign up to watch the debate at http://www.sports2debate.com/. Of course, you should only vote for me if you feel I'm worthy, but don't worry I'm ready to bring the heat. Apparently, I am the favorite in this thing, so let's hope I don't get George Mason'ed! Note: This will remain at the top of the blog until Wednesday. I will be posting dunks the next three days, but they will show up below this post. Sir Arthur absolutely destroys Scottie Reynolds with this dunk from last year's NCAA Tournament. Dahntay Jones dunks on Martell Webster. Dahntay Jones Dunks On Virginia's Nick V.L. 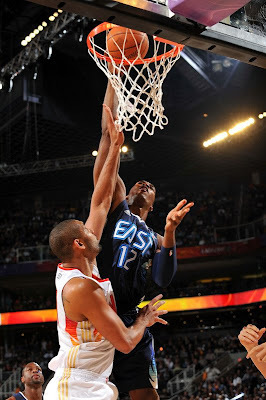 Dwight Howard putting Tim Duncan on a poster All-Star style. Kevin Durant throws one down on route to his Rookie-Sophomore Game record 46 points and a nice little MVP trophy to start what should be quite a collection of trophies when his career is over. Ronny Turiaf has been dunked on a lot this year, but this putback jam over Greg Oden is some nice revenge for him. Now this is what you call getting Powe-sterized. Hilton Armstrong just got downgraded once again. Michael Beasley gets a cart full of K-Mart. Last dunk from Chris Wilcox. 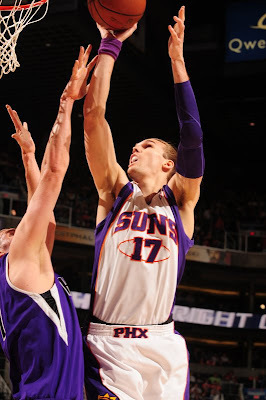 This one is a putback over Tyson Chandler. I noticed Wilcox likes to stick his arm out and push off people when he's flying through the air, which gets him extra poster-style dunks. Damn, that is NOT a good look for Greg Paulus. Didn't take long for him to get dunked on again. Ouch. Charlie Villanueva with the grown man dunk on Rodney Stuckey. This dunk is must see. Someone needs to find me a pic of this one ASAP. Butler serves two Raptors with a face full of jam. Check out this older dunk from DerMarr Johnson on our boy, Theo Ratliff. 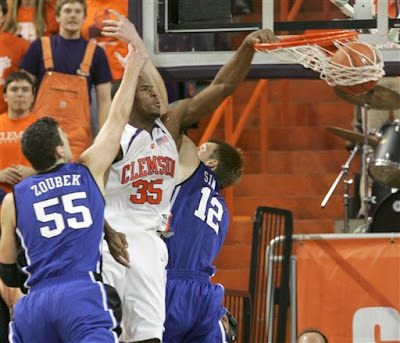 Clemson's Trevor Booker destroys 2 Dukees with one mean flush. Pun intended. "The highlight of the first half was USC reserve forward Marcus Johnson's spectacular fastbreak dunk over Cal freshman Jorge Gutierrez with 8:34 left. The 6-foot-6 transfer from Connecticut was so far off the ground that Gutierrez used his chin to foul Johnson's knee."
. Here he posterizes the Clippers' Ken Norman. Louis Amundson making an appearance with the jam on Spencer Hawes, who if you haven't noticed has been pretty much useless lately, unless he's getting dunked on! 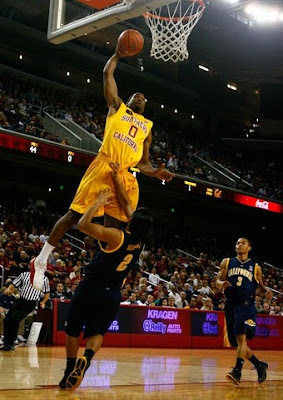 This is the other Willie Warren dunk I was referring to when I posted his dunks on Iowa States Justin Hamilton. Looks like Xavier got a face full of Lil Willie. Willie Warren posterizing Iowa State's Justin Hamilton. Nice dunk right here. Reminds me that there's another Willie Warren dunk I still need to add to You Got Dunked On.